Punk hairstyles offer us a great versatility. They can be adjusted to different physical and personal features as well as environments. You can play around with the length and style of Mohawk, the type of a side cut and the color of your thatch. To help you embrace your punk side and inspire you on changes, we compiled the collection of the best punk cuts. Many people underestimate punk hairstyles, considering them a fleeting fashion trend. However, in reality, these hairstyles symbolize a whole subculture. Aggressive and irrepressible followers of punk have been committing to such a lifestyle for about fifty years. Though, to be fair, many modern men sport punk haircuts without showing any inclination into the subculture. No matter what camp you belong to, have a look at our roundup of the most rockabilly punk hair looks. If you want all eyes on you, go for a high punk Mohawk dyed in a bright color, let’s say, pink. This punk staple of modern hairstyles for men does require quite a lot of maintenance and skills. However, it fully pays off with a constant attention of the public. 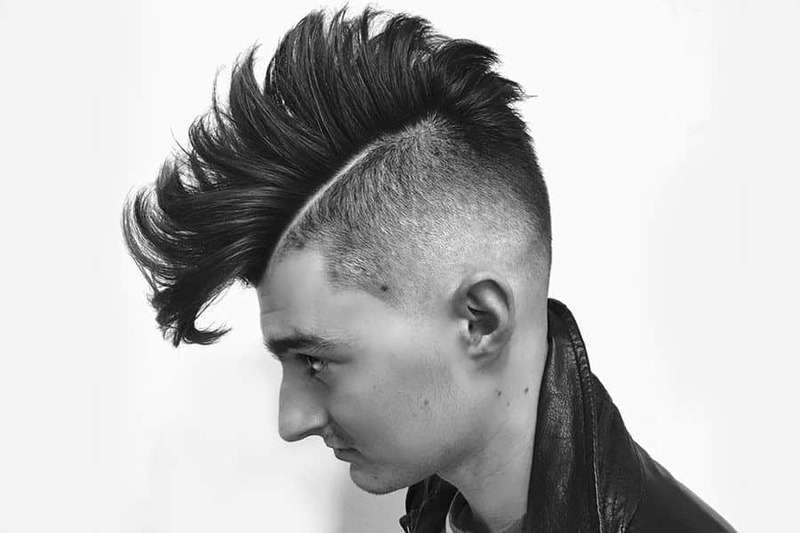 If you’re a punk guy who’s after neat and minimalistic haircuts, try out this flat top undercut with a tapered fade. The hawk goes along the top of the head, gradually changing the length from the longest in the front and the shortest in the back. Ideally, the faux hawk should blend into the hair at the nape. For added contrast, complete the look with a shaved-in line going round to the back. When you combine a spiky haircut with a Mohawk, you get a true killer look. You need to find a really skillful barber though, as cutting and styling this punk hair style requires a very high precision. On the sides, you can go for a high skin fade and shaved-in design, such as two parallel curved lines. Notably, to rock punk haircuts for guys, there’s no need to go with a Mohawk. You can basically get any hairstyle that has the features of this subculture. For instance, you can have a high undercut top, styled in the way you would normally have your hawk styled, pushed up and a little forward. For the most striking contrast, shave all the hair on the sides and back off. It’s better to pair such bold mens hair cuts with a little facial hair. 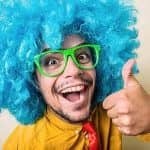 Many people frown upon a mullet haircut, considering it an 80s hair men style. However, with the right attitude, you can easily transform it into one of the punk or even Goth hairstyles. First, you can cut it shorter than the classic one and fade the sides. Second, the strands on top can be made wavy and dyed as well as the rest of the hair. And third, you can complement it with a punk or Goth man makeup. To accentuate your Mohawk fade haircut on the sides is one of the best options. If you opt for short hair on top instead of traditional long one, you’ll get a dapper and clean gentleman look. 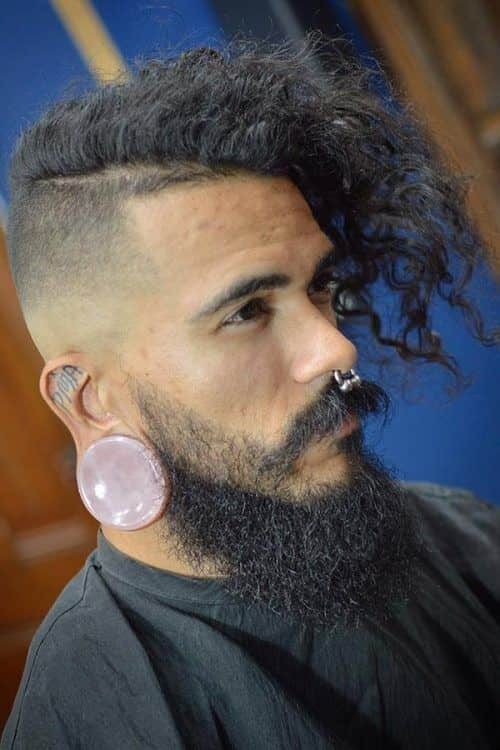 Punk curly hairstyles are a great rarity. It doesn’t mean though that they don’t look as cool as the straight ones. The natural texture of your wiry locks brings a new twist into the punk fohawk style. 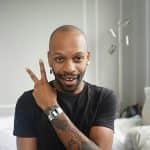 For lack of a full head of hair, short hair men would want to create the fantasy hairstyles using different colors and side cuts. Tone your hair with a honey-gold hue and have the sides tapered to the skin. 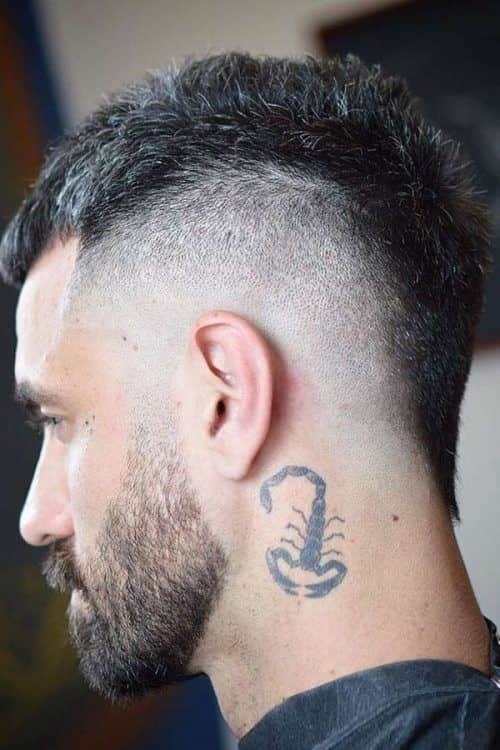 Even though this haircut has slick back hair, it comes out bold and dramatic due to a long top and undercut skin fade sides, which shows off the tattoos. 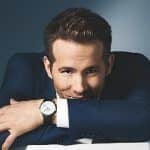 To style such short hair styles for men, apply a generous amount of gel and brush the hair on top back until you get the desired result. In case you’re not ready for drastic changes yet, you can try on one of the tribal punk haircuts instead. 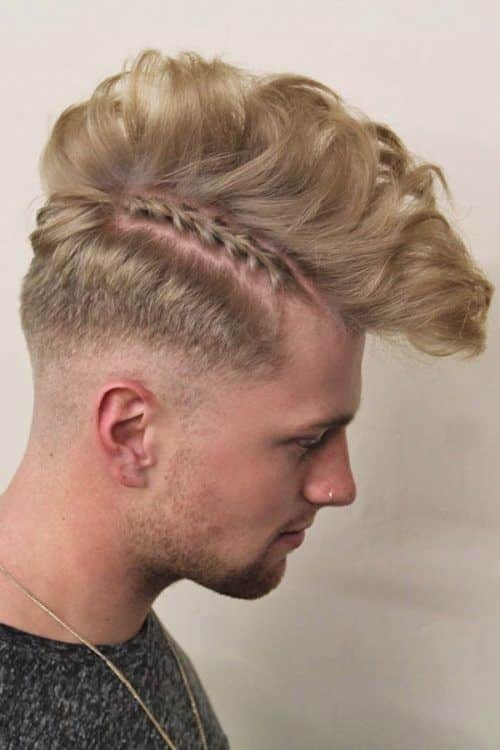 For such men hairstyles, tease the top of your head to make it seem like a Mohawk and braid the sides to create the shaved look. 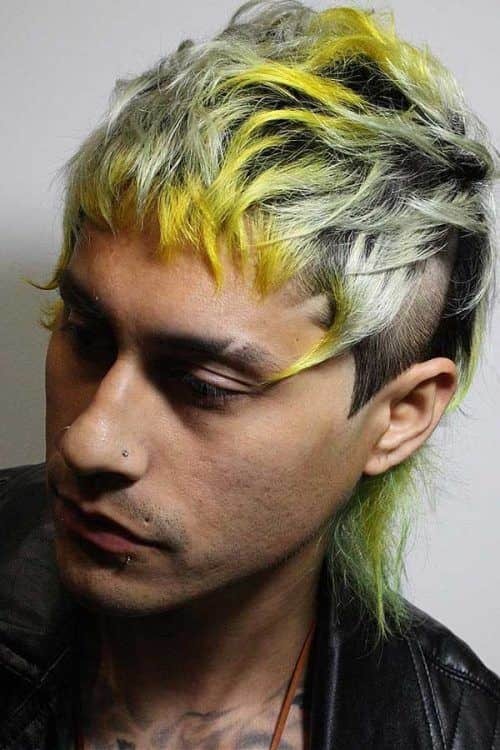 To achieve this example of ultimate punk guys haircuts, you’ll need to make a little effort. The hair in the middle should be cut in a narrow but long strip. You’ll have to apply a sheer amount of a styling product and pull the hair up to secure the Mohawk. Dyed in such punk shades as gold or pink haircut achieves the most striking effect. If you’re looking for more ideas on how to style short hair, we suggest making it shaggy. 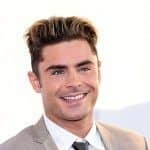 On the one hand, you get one of the trendy and low-maintenance mens haircuts, on the other hand, paired with textured bangs and tapered sides, it brings your look to the punk territory. Viking hairstyles aren’t related directly to the punk male hair styles. However, following the style that Norsemen used to sport, you can attain the look that reminds of the braided Mohawk. Ensure though that your hair is long enough to get it right. To accentuate your top long hair shaved sides are a great choice. An undercut is also a nice alternative for those guys who want to create a contrasty punk look without getting a real Mohawk.